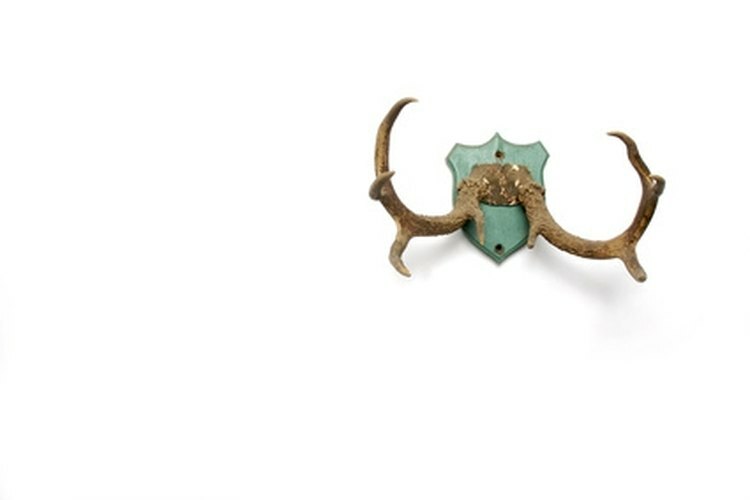 Restore symmetrical balance to antlers by repairing broken parts. Antlers are prided ornaments that celebrate a successful hunt and a love of outdoor recreation. However, an antler with a broken off part inevitably looses some of its dignity. An antler is easily repaired using repair or automotive putty. Glue on a broken or replacement part from a spare antler using the putty. If you do not have the broken part or a replacement part, an antler point can be sculpted with the putty. Sand the broken of ends of the parts to be glued together so they will sit as flush together as possible using a sanding wheel, a grinder or or a rotary tool with a sanding disk. They should be rough, for proper adhesion of the putty, but not jagged. Drill holes through the centers of both ends using a drill with a 7/64-inch drill bit. Fill the holes with repair or auto putty and smear a dab of putty on the ends using a putty knife. Twist two lengths of 12-gauge wire together to serve as a pin. Insert the wires into both holes and push the parts together. Secure the joint while the putty cures by bracing, clamping or placing the antlers in a vise. Fill any gaps in the seam with putty using a putty knife. Also use the putty knife to smooth down any excess putty that squeezed out. Sand down any imperfections along the seam after the putty has cured with sandpaper or a rotary tool with a sanding disk. Sand the broken of end using a sanding wheel, a grinder or a rotary tool with a sanding disk. It should be rough, for proper adhesion of the putty, but not jagged. Drill a holes through the center using a drill with a 7/64-inch drill bit. Fill the hole with repair or auto putty. Twist two lengths of 12-gauge wire together to serve as a pin and armature for sculpting the new antler part around. Insert the wires into the hole. Model putty around the wires that are sticking out using a putty knife until you form the shape of the broken off piece. Leave the putty to cure; sand down any imperfections with sandpaper or a rotary tool with a sanding disk. Mix together parts of artist’s paint colors to match the antler color. Paint colors that well suited for mixing an antler color include burnt umber, burnt sienna, Naples yellow, yellow ochre, cadmium yellow, gray and white. Paint the putty-sculpted area with the mixed and matched color.